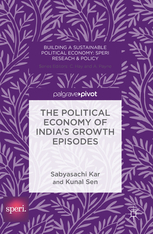 ESID’s Kunal Sen and Sabyasachi Kar have just published a new title, The Political Economy of India’s Growth Episodes. Described as an unconventional reading of India’s growth experience since independence, it deals in particular with the political economy and institutional factors that have been neglected in scholarship to date, and presents analytical structure for understanding different categories of state-business relations and their implications for growth. Read their working papers ‘Democracy versus dictatorship? The political determinants of growth episodes‘ and ‘The political economy of economic growth in India, 1993-2013‘.